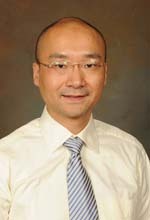 Dr. Peng is currently assistant professor of MSE at Clemson University, and affiliated faculty member of Clemson University School of Health Research (CUSHR). He received his Ph.D. at Georgia Institute of Technology, and M.S. and B.S in Tsinghua University. Dr. Peng’s research has been focused on the materials fabrication and properties for medical and health applications, extreme environments and renewable energies. His current researches include develop smart bio-components using additive manufacturing, sensor materials for diagnosis and health monitoring, smart embedded sensors for joint replacement and dental implants, bioactive and biocompatible thin film and coatings. Dr. Peng has extensive ceramic materials research experience and development of smart bio-components using additive manufacturing. He has been awarded, as PI and co-PI, the research grants from federal agencies such as DoD and corporate sources. He has published 31 peer-reviewed journal papers, and is the leading author of several highly cited papers in his field. He is now serving as a member of advisory board of Bulletin of American Ceramic Society. He also organizes and serves as session chairs of professional conferences such as Fiber Society Conference and MS&T. Chen, Z, Gu, Y., Zhang, Z, Kornev, K., Luzinov, I., and Peng, F.,"Measuring flexural rigidity of mullite microfibers using magnetic droplets." Journal of Applied Physics, 117, 214304 (2015). Fang, M., Liu, F., Min, X., Huang, Z., Liu, Y. G., Wu, X., Tang, C., Zhang L., and Peng F., "Effect of temperature on solid particle impact erosion wear mechanism of 5 mol% Yttria Stabilized Zirconia ceramics," Ceramics International, 41 , 6807-6811, (2015). Chen, Z, Zhang, Z, Tsai, C.C., Kornev, K., Luzinov, I., Fang, M., and Peng, F.,"Electrospun mullite fibers from the sol-gel precursor." Journal of Sol-Gel Science and Technology, 74 , 208-219 (2015). Gu, Y., Chen, Z., Borodinov, N., Luzinov, I., Peng, F., Kornev, K., "Kinetics of evaporation and gel formation in thin films of ceramic precursors." Langmuir, 30 , 14638–14647 (2014). Chen, Z., and Peng, F., "Normal and abnormal grain growths in BaTiO3 fibers." Journal of the American Ceramic Society, 97 , 2755-2761 (2014).